The myth out there is that you cannot eat healthy on a budget, but after reading these tips and trying them, it will no longer be a myth to you! Eating healthy is one of the best things you can do for yourself and your family. When you eat a nutritious and balanced meal, you feel better, have more energy to do the things you love, and you can reduce your risk of many diseases. Sometimes choosing healthy food can be a challenge, but don't make an excuse, make an effort. 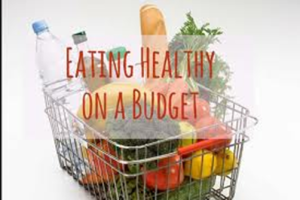 With planning and effort, you could eat even healthier while saving money. Many processed foods like frozen dinners are almost always prepared with sugar, unhealthy fat, and salt. Use these tips to help you make choices that are not only healthy but economical. 1. Plan your meals ahead of time- think ahead about what kinds of meals you like and plan to buy the ingredients for a few meals at a time. You will be less likely to eat something just because it is quick and convenient, such as a gas-station hot dog, or nachos with cheese, which are both expensive and not nutritious. 2. When short on money, base a meal around brown rice, whole grain pasta, potatoes or other whole grains. 3. Plan your snacks as well! The following make good nutritious snacks: fruits and vegetables, low-fat cheese, trail mix, or whole wheat crackers. 4. If possible, choose a grocery store where food tends to be less expensive; always remember to take your coupons. Avoid convenience stores. Eat a meal or snack before shopping. People tend to buy things they don't need when they shop hungry. Look at the shelves carefully; grocery stores put the more expensive and unhealthier items at eye level. Fruit and vegetables- apples, bananas, oranges, potatoes, cabbage, carrots; plain or mixed frozen veggies without pre-packaged sauce and canned tomatoes are usually less expensive choices anytime. Dairy products - milk and plain yogurt are low-cost dairy choices. Powdered milk is half the cost of refrigerated milk and is stored on the shelf until ready to be mixed for cooking, baking, or can be made into milk to drink. No-name/generic cheese is less expensive than name brands. Meat and meat alternatives - peanuts butter, eggs, beans or lentils, blade or rump roast, canned tuna, sandwich steak and chicken are the most economical choices and those on sale. Grain products - whole wheat bread, pasta, rolled oats; hot cereal and whole grain rice are healthier and can be the center of a healthy meal. Try to avoid fancy pasta shapes and pasta or rice packed in sauce mix. Many products that come with sauces or mixes are higher in salt, sugar, and fat, and are more expensive because of the convenience. Mameni Linga, born and raised in Liberia, relocated to Colorado, where she graduated from the University of Colorado at Colorado Springs. Currently a graduate student in D'Youville College dietetics program, she volunteers with community agencies such as Literacy NY and Meals on Wheels. Upon graduating, Mameni plans to focus her passion for health and dietetics by working within public health agencies that promote preventative health care.